Using molecular methods for plant disease diagnosis provides diagnosticians with a number of advantages over more traditional methods. They can allow the identification of morphologically similar species, for example, or the detection of infection prior to symptom formation. Not only can molecular tools help by increasing the efficacy, accuracy and speed of diagnosis; their common technological basis provides further benefits, especially where resources are limited and traditional skills are hard to sustain. 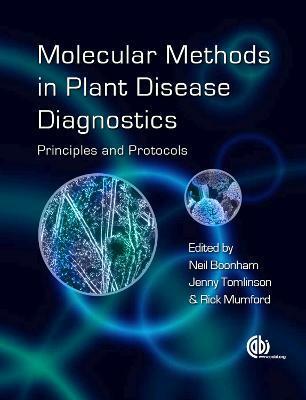 This book provides protocols for nucleic acid-based methods currently applied to plant pathogen detection and identification. It takes the practitioner through the full range of molecular diagnostic and detection methods and, as these generic techniques are appropriate for use on any target with minimal modification, also provides a useful resource for students of plant pathology and plant pathologists. Beginning with the background and future directions of the science, it then addresses DNA barcoding, microarrays, polymerase chain reactions (PCR), quality assurance and more, forming a complete reference on the subject. N. Boonham is at Fera Science, UK J. Tomlinson is at Fera Science, UK. R. Mumford is at Fera Science, UK.